Surprise, surprise! The Story of Minglan 知否知否应是绿肥红瘦 couple Zhao Liying and Feng Shaofeng are just full of surprises lately. 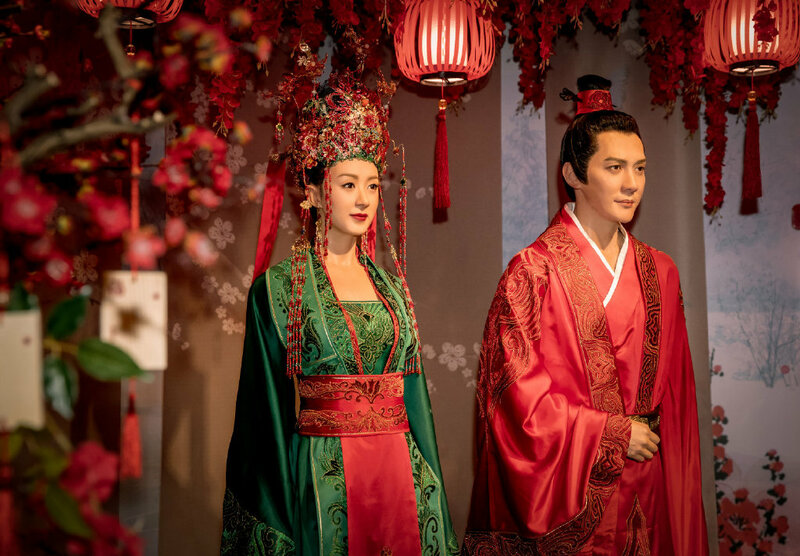 They are the newest tenants at Madame Tussauds Shanghai. 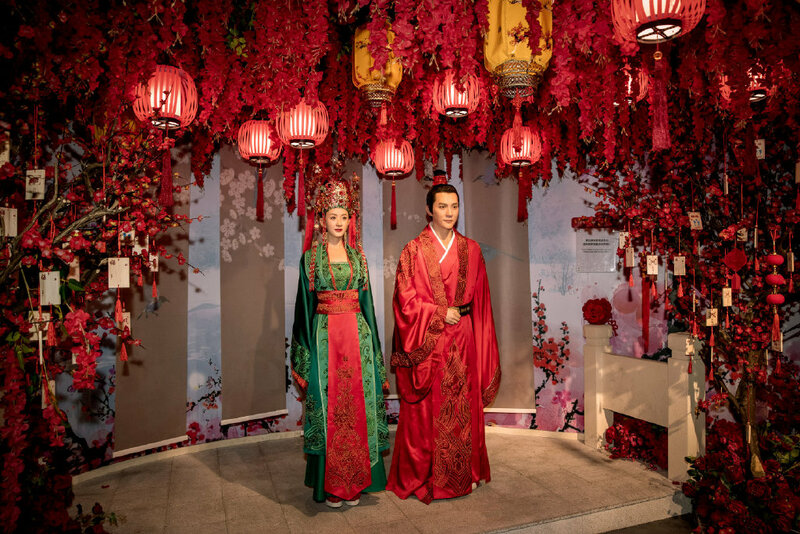 Their wax figures and the bright decorations capture the festiveness of Minglan and Er Shu's (Gu Tingye) wedding day which aired on TV not too long ago. It's also the first time that a character(s) has made it into Madame Tussauds Shanghai while the show is still airing. If there weren't enough Minglan and Er Shu moments at the beginning, the story post-marriage proves to be quite satisfying for anyone who has patiently waited for the two to finally end up together. The has shifted completely towards the couple and focused on the little and big things from their pillow talk, disagreements to their united front in taking down their enemies. Doesn't look too much like them but better than the PA wax. So...can anyone tell me why Minglan is wearing the Green color as her wedding gown? And not the traditional full red gown as a wedding gown??? Can someone let me know what the history of that is or did the production team wanted it to look like Christmas instead with the Red and Green theme? I read somewhere that it's Song dynasty thing. In the drama, you her 4th sister also had a green dress on her wedding day. I have seen occasionally seen green wedding dresses in other dramas. Speaking Rise of Phoenixes it is yet another boring drama but I wonder why even somebody like Ni Ni and Chen Kun didn't get wax figures. The cinematography did not lose to any other productions? I heard people preferred the 2nd characters more bc Ming Lan character is too bland, and it's suppose to be smart but ZLY acting made it turned out half-baked. 2nd leads need to get more appreciated, just because they're not main roles does not mean they are not as good. Well, this couple went from Real to Reel to Real Marriage. The two of them sure knew how to do media play in keeping their drama and ZLY as the most trending topic on the Chinese Websites. No amount of paid publicity can keep the audiences waiting for an answer from ZLY. From the couples dating or not dating, to is ZLY pregnant speculations up to and after the airing of Minglan, then the surprise Marriage Announcements, then after more than a few months, ZLY's confirmation of her having a baby. So, these two really knew how to keep everyone's interest and no doubt that Madame Toussads is wanting to cash in on that too as the Minglan drama is still airing. Anon 6.a That is very incredible, I don't recall YM being the top search star even with her divorce romors. Follow up was her trying to get custody, still not a top search. Very funny why somebody wants to be top search regardless of the reasons being good or bad. I guess YM is smart that she does not want to be well known for the bad news about herself. Smart people like Zhou Xun and Chen Kun also did not make fans go everywhere saying their dramas are totally the very best. If you find Ruyi and Rise of the Phoenixes boring, TSOML is ten times more boring, what a laugh that fans are saying TSOML is good when it's not even average. It is even under what I call below average, it is that bad. Why would anybody want their drama to be called the best when it's the worst? Anyway I just find some fans so much more entertaining than TSOML, they would stretch the story of that drama in all directions and find every ways to convince people about good things that are so untrue. 6b. You seem to have a dislike for ZLY. Is Minglan bad?..It is very slow, and very Dreams of the Red Chambers-ish....however, the side characters do get highlighted well, Minglan's Father and "Big" Mother are not shown as the big bad people. Humans are complicated beings, they treat each person differebtly. I would not say that ZLY acting is that great here either, but ZLY is a good actress in general and know how to pick scripts. I am not a fan of anyone, but usually pick my shows based on actress and actors that I know. ZLY and FSF at least kept the momentum of media play going. Even when she can't come out and promote her drama. I find most palace drama's boring especially when it is a fight between the women and made by Mainland drama. I honestly ever only liked the one with Gigi Lai, Charmaine sheh's TVB palace drama because they had so many good actress and very beautiful ladies along with the pretty costumes. The guys Bowie Lam did so well too. I like ZLY. But I don't like how untruthful her fans are. Most of her projects are just terrible, the only way you can say some of them are even good is to lie. I can name them all but this time, TSOML is just the worse. I can't believe people would say this is a realistic drama. Yhea, the characters are not located in the palace anymore. However, please, the boring women slandering each other is still the main cake. Just because they change the environment, and make a pace extra-extra slow, that does not make things more realistic. In TSOML, script is similar to Ruyi. The vibe and feel is all Ruyi. But, the hype though... is not on the same level with Ruyi. What else can I say if it's not ZLY alone entertaining all her viewerships again? I've seen slice of life dramas before. This is not how any drama should be directed. For example, Chen Kun and Dong Jie's The Story of a Noble Family did a fantastic job portraying the old culture of a certain era. The pace was not slow like this, absolutely nothing like this. It is not slow pace because you see Lin Dai Yu (who is convincingly weak and shy) walks and sits elegantly, she joins a family, not knowing the rules, keeps looking at others and copy them...etc. It was interesting!! Lots of actions happening there! The first time she meets Bao Yu, that part was written to be something like magical (cant find the right word) like meeting an old friend, they directed that nicely. It was amazing at every seconds. But what I get from TSOML is...well not always something is exactly happening. Or, sure something is happing, but they are totally boring things that are happening, something that is so uninteresting that people are careless about. Like, who needs to watch Mo Lan and her mother sit with no action but just whispers at night ten times? Lots of the conversations in TSOML are so ridiculous to watch.